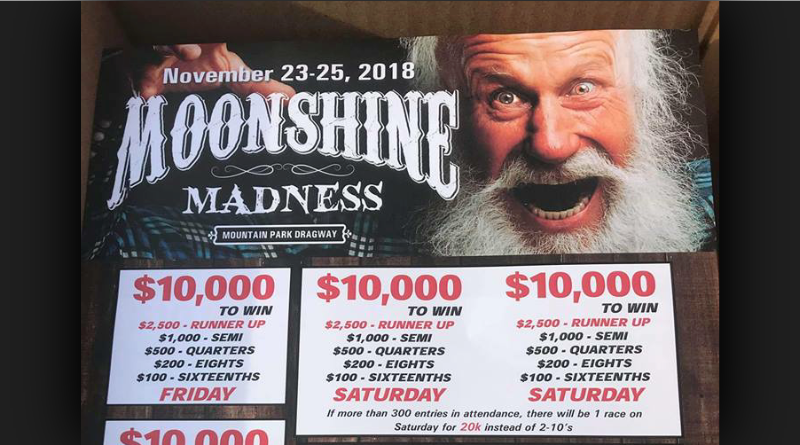 CLAY CITY, Ky. – Mountain Park Dragway and Scotty Richardson bring big money bracket racing to the Kentucky facility with the Moonshine Madness bracket race. Hosted over the Thanksgiving weekend, the event offers four $10,000 to win bracket races along with Jr. Dragster racing each day. If more than 300 cars enter on Saturday, the two $10,000 to win events will be combined into one $20,000 event. For more info see the event flyer below or contact Scotty Richardson.